These pocket affirmations were inspired by one of my best customers by placing a special order of this design. She slips them in with her Etsy orders as a thank you! I was thinking, why not come up with a bunch of them? You can slip them in lunchboxes, bathrobe pockets, in cards and letters~anywhere you want to send a nice message. The picture is on the front and the message is on the back. Each card gets cut slightly different but they all end up measuring approx 3" x 3 1/2" and come 6 to a package. 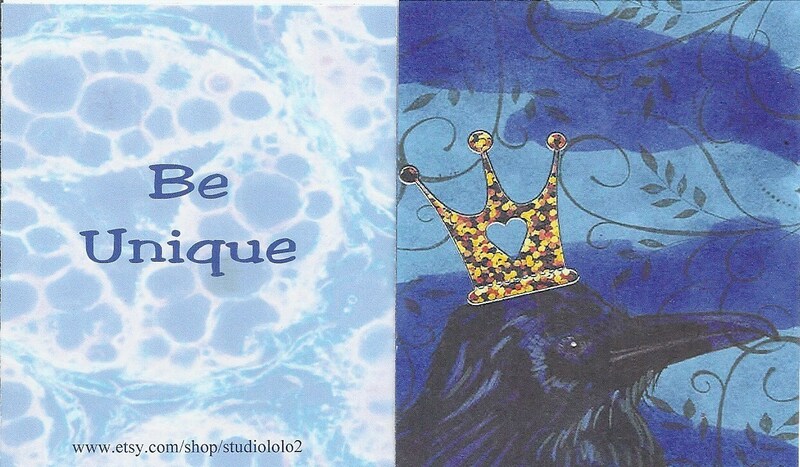 Such a unique affirmation card that reminds us to be unique. Perfect in every way. Thank you for packaging with care and shipping quickly. Look forward to ordering again real soon. These min affirmation cards are the sweetest little things to place with gifts, orders, in journals, scrapbooks and on the fridge for inspiration. Love these!! Thank you for wonderful customer service and fast shipping! !